Produced: ATV for syndication via ITV regions throughout the UK. The Jensen Code - A Synopsis. The story begins with 16 year old Terry Connor sat alone in a cavern 100 feet underground whilst on a pot-holing expedition. The senior outward bounds instructor, Alex, has long since been missing in the depths of the cavernous subterranean pot named 'Wilmer Deep' after going to retrieve a torch that Terry had dropped earlier. When Alex returns (without the torch) he is strangely convinced that he has been away for a couple of minutes, but Terry knows that Alex has been away for more than a couple of hours. Alex believes that Terry has suffered hallucinations, which he says can be a side-effect of the confined darkness of an underground cavern. When they surface Terry believes he has seen man watching them, to which Alex again suggests it is a hallucination and that Terry he is not cut out for pot-holing and so should not go on the big pot-holing expedition which the rest of the students will be going on the next day. Returning to the outward bounds center Terry is subjected to much ribbing by his fellow students including the ring leader Jacko. Terry is convinced that the center, or the students at least, are being watched, and when the others inform Terry that there is a Ministry Of Defence research establishment nearby he begins to feel increasingly uneasy. Another instructor at the center, Gordon, becomes aware of Terry's concerns and tells him that he believes his story that Alex had gone missing for two hours, but that he can't say much more than that. The following day, Terry is detailed to go on his own day and night solo trek above ground. But eager to prove to himself that he is unafraid of the pot, Terry sets out to return to Wilmer Deep. But first, he needs to obtain the key to the gate which covers the pot, and that key is kept at Granny Powell's cottage. When Terry turns up at the cottage he is unexpectedly joined by Alex, who is accompanied Kurtz, by the man that Terry had seen spying on them the previous day. Strangely Alex appears vague, and seems to have no recollection of setting Terry the day / night trekking task. On the way to the pot, Terry witnesses Alex and Kurtz performing a kidnapping. Terry rushes back to the center to tell Gordon, who says he works for the security department within Ministry of Defence, and that he is investigating Alex whom he believes is intending to endanger the life of a scientist in the nearby MOD research unit using the Wilmer Deep pot as a cover to gain access to the research establishment. Gordon also informs Terry that the person who has been kidnapped is Dr Jensen, the only man who knows important strategic launch codes for important international space and military launches. Gordon takes Terry to a safe house to keep him safe from Alex and the kidnappers. But the safe house turns out to be Granny Powell's cottage, and becoming increasingly uneasy about the consistency of Gordon's story, Terry manages to make his escape from the cottage when Gordon's back is turned. On the run, Terry stumbles into a barn, which is housing both Dr Jensen along with a rather confused Alex, who doesn't seem to remember him. Kurtz and the sinister Mr Richards find the three in the barn, and they lead the Alex away and lock in Terry and Jensen. Alone in the barn, Jensen explains that Alex seems to have been hypnotised. Jensen also confirms that he knows the reason that he has been kidnapped, and that reason is for the code that he alone knows - The Jensen Code. He tells Terry that Richards has already tried to hypnotise him, but at the moment he has proved strong enough to repel Richards strong mind-control techniques. The following morning Terry is removed to the cottage where he is subjected to the powerful hypnosis performed by Richards. When Richards is called out to hunt down an escaped Jensen, Terry escapes to the safety of the police station he remembers nothing, not even his name. But there is something nagging at the very back of his mind, in his confusion he believes there is something important he needs to remember but it just won't come to him. After a few days convalescence at home, Terry is still eager to find some answers to the nagging doubts that linger in his mind, he decides to return to the outward bounds center, and accepts a lift from a vaguely familiar gentleman - called Dr Jensen. The Jensen Code - The Cult of... The Jensen Code. The Jensen Code is no ordinary children's drama. Produced by ATV with a story written by the novelist and dramatist Carey Harrison (son of actor Rex Harrison), the 13 part series was screened throughout the ITV network during the early months of 1973, in a 16.50 to 17.20 time slot. What is truly special about the piece is the extent to which the luxury of having 13 episodes allows the story to both to breathe and organically develop to an extent which few other of it contemporaries have enjoyed. Certainly it would be absolutely unthinkable for a modern audience to be afforded such a luxury. It could be argued that the show is perhaps two episodes too long, with the episodes about three quarters in being the prime offenders where plots are not developed to any great extent. These episodes certainly would have benefited from some judicious pruning, but for a story of this length, the amount of actual 'filler' included within is surprisingly minimal. The lead character of Terry is played by David Bradley (who made his acting debut playing the lead character Billy Casper in Ken Loach's film Kes some three years earlier). Other significant cast members include Brian Croucher, (a familiar face on TV during the 70s and 80s - and perhaps most remembered for his role of Space Commander Travis in Blake's 7), and children's TV stalwart Milton Johns - principally remembered for his role as the over officious Mr Cassidy, in Murphy's Mob, but who also served in many other children's TV shows such as Into The Labyrinth, Tucker's Luck, King Of The Castle and Midnight Is A Place. Perhaps the best known member of the cast is Karl Howman, who plays a teenage jack-the-lad named Jacko, a chilling portent of what would come to pass some 15 years later when Howman would give his legendary non-performance as middle-aged jack-the-lad Jacko, in the woeful 'sitcom' Brush Strokes (it had superb theme tune by Dexy's Midnight Runners though). One of the most stunning aspects of The Jensen Code is its location filming. With a proportion of the action taking place down a pot hole it would have been a significantly easier option to build a set to capture those scenes, however, the scenes were filmed on location (in the Clearwell Caves, at Coleford in the Forest of Dean). This aesthetic decision pays off beautifully, with a suitably claustrophobic subterranean atmosphere coursing through those scenes. I wouldn't say that The Jensen Code is a particularly well known, or more accurately, oft-remembered series, but that does it a disservice. The combination of a very well written and expansive story, allied to some very nicely judged dramatic performances turned in from a more than competent cast, marks this out as a cut above many of its contemporaries. I would also venture that the quality of the series was such that, perhaps in a shortened format, it could have easily graced the schedules aimed at an adult audience. Whilst both Sky and The Children Of The Stones deservedly have carved out their own unique niche into cult TV folklore, The Jensen Code, whilst not being as immediate, truly deserves to be held in very similar esteem. Unsurprisingly it is the wonderful cult TV and film label network who have given The Jensen Code its first commercial release. 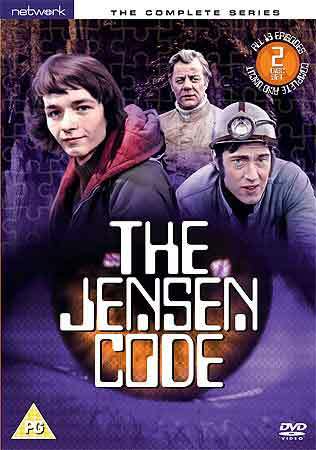 Like its contemporaries SKY, Escape Into Night and King Of The Castle, The Jensen Code is available exclusively from the network site. The DVD release includes all 13 episodes of the series, which were originally made in colour but are presented here in Black and White. This is due to the fact that all the original master tapes are have long since been junked from the archives, and these precious black and white versions are taken from copies made exclusively for overseas sales. Also included in this set is the sole remaining colour episode (episode 6) which is practically a full episode though is subject to some slight damage to the soundtrack. Watching the sole remaining colour episode the colour format, perhaps unsurprisingly, helps set the series in its correct time setting i.e. 1973, with the black and white episodes giving an impression more of a mid 1960s feel. Whilst the colour picture makes the episode more visually impressive, the black and white presentation does, in its own way, add a certain atmosphere which is not out of step with the production. Of course the real joy is that this series still exists in any forma at all, and further that Network have now made the series available for a fresh audience to enjoy. The 2 disc set contains all the 13 episodes from the series, and understandably very few extras. Besides the colour episode previously mentioned (which well worth taking a look at), the other extra is some original studio literature about the series, which includes synopses of all the episodes, cast details etc included here in PDF format. I would urge any fans of children's TV drama in general (and fans of 70s children's drama in particular) to check out the series as, despite it relative anonymity, there is a huge amount about the series that is very commendable, and it is on the whole extremely watchable and hugely enjoyable. Hopefully with this excellent DVD release, the series will gain the level of following that it truly deserves, but that, due to its invisibility since its original TV transmission, it has so far been denied.